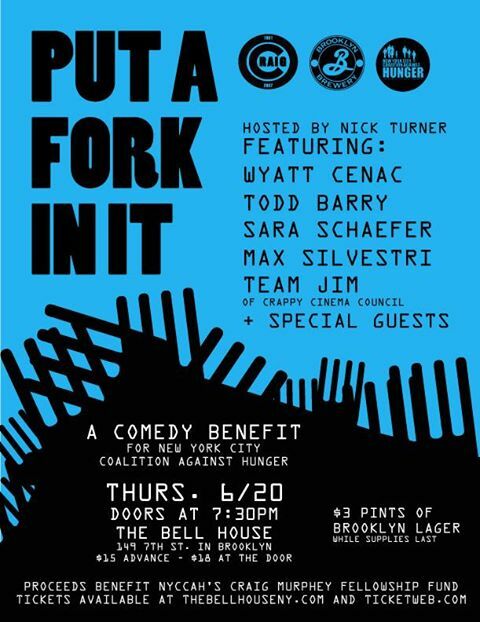 “Put A Fork In It” Comedy Benefit Tonight at The Bell House w/ Reggie Watts, Todd Barry, Sara Schaefer and More! Hey folks, if you’re looking for a fun comedy option for tonight, you can’t go wrong with this show, and it’s for a good cause. A benefit for New York City Coalition Against Hunger’s Craig Murphey Fellowship Fund hosted by Nick Turner. Next Post Tropfest Is Saturday in Prospect Park w/ Chairlift, Liev Schreiber and More!